You’ve probably seen plenty of seeing-eye dogs and other service dogs over the years. But did you know that animals can also be hugely beneficial for people living with dementia? Pet therapy is now being integrated into many dementia care strategies for this reason, so read on to learn about how this type of therapy works, and why it’s so beneficial. Pet therapy involves the use of dogs and other animals to help people cope with health problems, and recover from diseases and disorders. 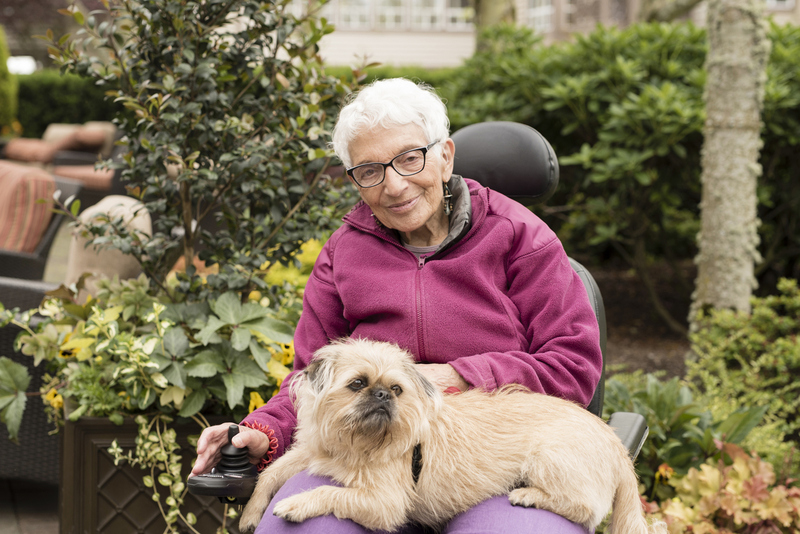 For people living with dementia, this therapy involves guided interactions between the individual, a trained animal, and the animal’s handler. Some of the therapeutic experiences can include petting, brushing, walking, and caring for the animal. Many studies have found a link between pet therapy and an overall improved emotional well-being and positive outcome in people with behavioural issues, medical conditions, and autism. This therapy can be either individual or in a group setting and is sometimes also led by a qualified therapist. Pet therapy began in the early 1990s, so it’s a relatively new type of therapy. However, it quickly gained a wide acceptance within mainstream psychology, and many universities around the world are now offering graduate courses in animal and pet-assisted therapy. There are many well-documented pet therapy benefits for people living with dementia, and it’s easy to see why this therapy is becoming more and more popular amongst therapists and aged-care providers. One randomised, controlled trial involved dog-assisted therapy for 60 people living with dementia. All participants in the trial significantly increased their pro-social behaviour and reduced behavioural disturbances while interacting with the dog. Neuropsychiatric symptoms were also reduced. For people living with dementia, loneliness, depression, anxiety, and confusion are common. Pet therapy can help reduce these symptoms and remove some of the anger, helplessness, and frustration experienced by those living with dementia as their condition progresses. One study evaluated pet therapy at an adult care center for elderly people living with dementia. The results showed that when individuals were involved in activities with the dogs, their feelings of sadness and anxiety decreased, and they experienced more positive emotions and increased their physical activity. One of the biggest benefits of pet therapy is that the increased mental stimulation from interacting with the animals also increases memory recall. Those living with Alzheimers and dementia are also able to sequence temporal events more easily and are automatically more relaxed as oxytocin, prolactin, and serotonin are released. Most of the studies involving pet therapy were conducted in care facilities. However, many of the same benefits can be found with a pet at home. If you have a family member with dementia living at home, you may want to consider getting a pet. This may mean a little more work remembering to feed and care for the pet. But in exchange, a furry friend will help provide your loved one with companionship, reduce their agitation and anxiety, give them an excuse to get some exercise and improve their social interactions. Therapy dogs for dementia are currently being used throughout Australia, and for a loved one with more advanced dementia, actual pet therapy may be the best option. PAWS Pet Therapy is a not-for-profit charitable organisation providing pet-assisted therapy visits for people living with dementia, and those with disabilities, mental health issues, and more. The Pets As Therapy (PAT) program has been offered by Guide Dogs ACT/NSW for more than 30 years, and these dogs can be placed within the home or within residential facilities. The Delta Society also has an excellent Therapy Dogs program which involves visits to both children and adults in nursing homes and hospitals throughout the country. As you can see, there are many options if you’d like to get started with pet therapy.